Javier knows perfectly well that his piña fiber is uniquely delicate, transparent, well-ventilated, yet strong. This combination is why piña is the traditional choice for a man’s barong tagalog or a woman’s wedding dress or fancy blouse. 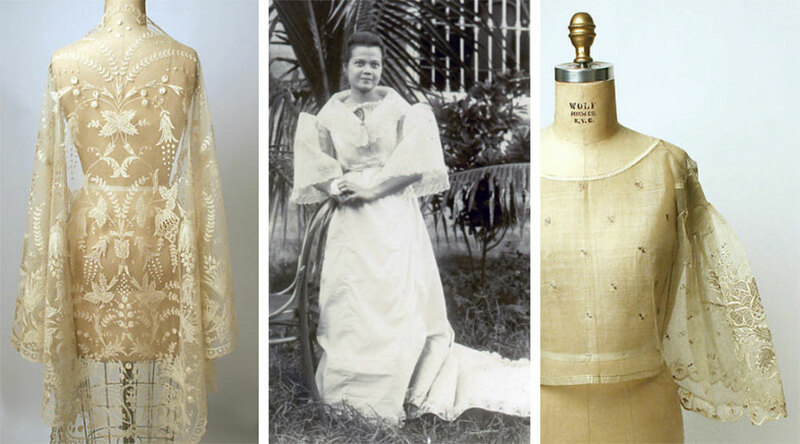 From left to right: 19th-century piña shawl from the Metropolitan Museum of Art; Philippine-German mestiza wearing a baro’t saya from the Philippine Photographs Digital Archive; and a piña blouse, also from the Met. The green epidermal layer is scraped off the leaf with tools made from coconut shells, coconut husks or pottery shards. Extraction from the long, stiff leaves is time-consuming and labor-intensive. 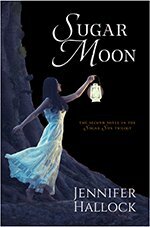 These fibers are then spun into soft, shimmering fabrics by hand. Because the fiber is fine and breaks easily, working with it is slow and tedious. Workers are constantly knotting broken threads. That is not the end of the process, either. It takes weeks more to prepare the yarn and then weave it together into patterns like flowers, fruits, coconut trees, and nipa huts—whatever the artist wants. According to the Folklife Museum, it can take eight hours to finish one meter of plain cloth or just half a meter of patterned cloth. 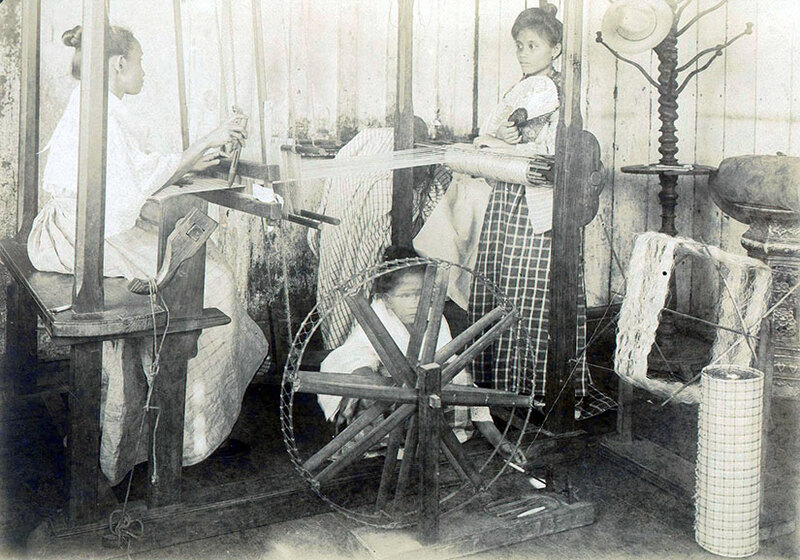 Turn-of-the-century photo of girls weaving piña from the Philippine Photographs Digital Archive at the University of Michigan at Ann Arbor. All to make ladies look gorgeous and men look handsome? Yeah, it’s worth it.